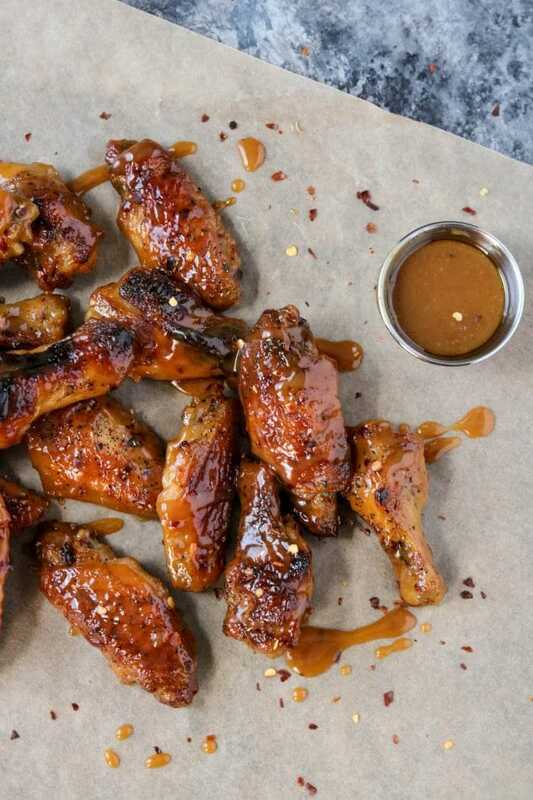 You get the best of both worlds with these sweet + spicy Hot Honey Mustard Wings. We love chicken wings in our house – take a look at all of our favorite Chicken Wing Recipes. 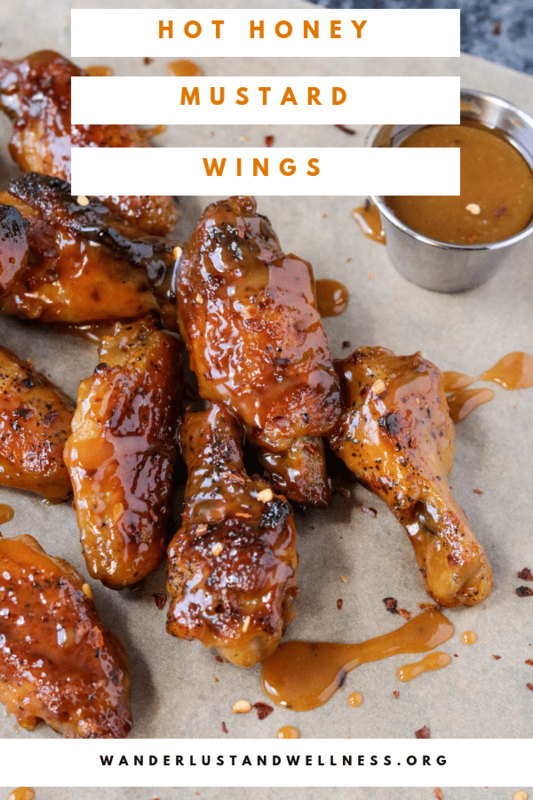 These hot honey mustard wings are also gluten-free and made with just a few ingredients, giving you a delicious homemade wing recipe. Chicken wings are a staple in our house, like these hot honey mustard wings. Our house is divided between those who like the buffalo ranch chicken wings and those who like the sweet and spicy hot honey mustard wings. If you ask me, they’re both DEE-LICIOUS! These hot honey mustard chicken wings are another perfect appetizer to add to your menu for your next party, or maybe Super Bowl Sunday, or maybe just because you LOVE wings (like me)! 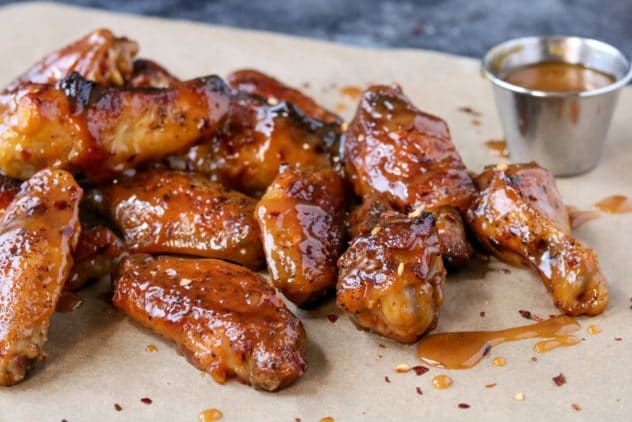 Are hot honey mustard wings gluten-free? Yes! There is no breading involved, and the sauce recipe is also gluten-free. Are baked chicken wings crispy? Yes! Even though there’s no frying involved, the wings still come out with a nice crisp. If you want them even crispier, you could use your air fryer to baked the wings. To prepare the hot honey mustard wing sauce combine the following into a small saucepan and heat over medium-low heat. Chicken wing inspired recipes you may like! 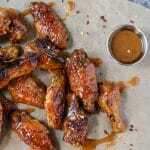 Delicious hot honey mustard wings with a sweet and spicy honey mustard wing sauce. Place the wings/drummettes onto a broiler pan. If you don’t have a broiler pan, line a baking sheet with foil and place a cooling rack on top of the pan. Place the wings onto the cooling rack. Season wings with salt and pepper and place into the oven for 40 minutes. In a small saucepan, combine the honey, dijon mustard, sriracha and red pepper flakes and heat on medium low, stirring occasionally. After 40 minutes, remove wings from oven and dip individually into the sauce, placing back onto the broiler pan. Once all wings are coated in the sauce, place back into the oven for an additional 10 minutes. After 10 minutes, turn the oven to broil and broil for 3-5 minutes, watching closely. You’ll want the sauce to char a little but not burn. This methods cooks the sauce into the wings.